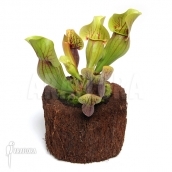 The carnivorous plants of the genus Sarracenia are found in USA and Canada and are called trumpet pitchers. This carnivorous plant genus consists of eight different species. These exotic plants usually grow in moist areas where various crossbreeds do occur. Besides the natural species of Sarracenia there are numerous man made beautifull crossbreeds of this carnivorous plants. The motionless lid of Sarracenia has glands that produce nectar that attracts prey. Care of Sarracenia is fairly simple. 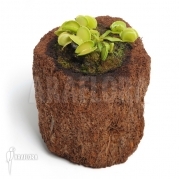 This species of carnivorous plants can be kept in a windowsill or can be even be kept outdoors. The plants of the genus Sarracenia are found in the south-eastern United States (from North Carolina to Florida and East Texas), the north-eastern states and in Canada. This genus consists of eight different species that usually grow in moist areas in savannas between branches and open pine tree forests. Sarracenia flava, Sarracenia purpurea and Sarracenia leucophylla are the most common species and are also available as houseplants. The other five species are Sarracenia alata, Sarracenia rubra, Sarracenia psittacina, Sarracenia minor and Sarracenia oreophila. Beside these main species there are several subspecies and varieties, as well as a large number of natural and cultivated crossbreeds. All eight species are perennial plants of which the pitcher shaped leaves stem from a rosette-formed, crawling rhizome. Sarracenia purpurea and Sarracenia psittacina have compact pitchers that are situated just above ground. The slim pitchers of the other species are erect and grow often to about 1 metre high. Examples are Sarracenia flava and Sarracenia leucophylla. At the end of the growing period, fairly thick and wide stems of the leaf are formed which no longer grow into traps. All species have a lid above the pitcher that, apart from Sarracenia purpurea, functions as a little roof to protect the inside of the pitcher against rainwater. This motionless lid of the pitcher has glands that produce nectar. Its colour and scent is appealing to insects. A trail of nectar leads to the inside of the trap. If the prey reaches the entrance of the pitcher it will be lured even further into the pitcher. The next area of the pitcher has a slippery wax coating, which causes the prey to fall down into the pitcher. Inside the trap, enzymes that the plant produces digest insects. The transparent windows on Sarracenia psittacina, Sarracenia minor and Sarracenia leucophylla will confuse the insect so it chooses the wrong exit. Plants that are cultivated outside show the effectiveness of the catching mechanism of the Sarracenia genus; the pitchers are usually filled to the rim with insects. The flowers of the plant distinguish themselves from other flowers by a curious shape that resembles an upside-down umbrella from which the pitcher leaves stem. The pollen is found on the underside of the flower. The pollen is transferred from flower to flower as the insect seeks nectar. The flowers of Sarracenia vary in colour from red-orange-yellow to all sorts of purplish-red hues. Care of Sarracenia is fairly simple. This species of carnivorous plants can be kept in a windowsill or can be even be kept outdoors. Please find below the Araflora productinfo and Araflora plantcare sheets for additional information about the cultivation and care of this carnivorous plant as well as the exotic plants Araflora is offering in this category.